What weighs in at 105 kilograms (231lb) and measures nine metres (30 feet) from mantle to tentacle tip? 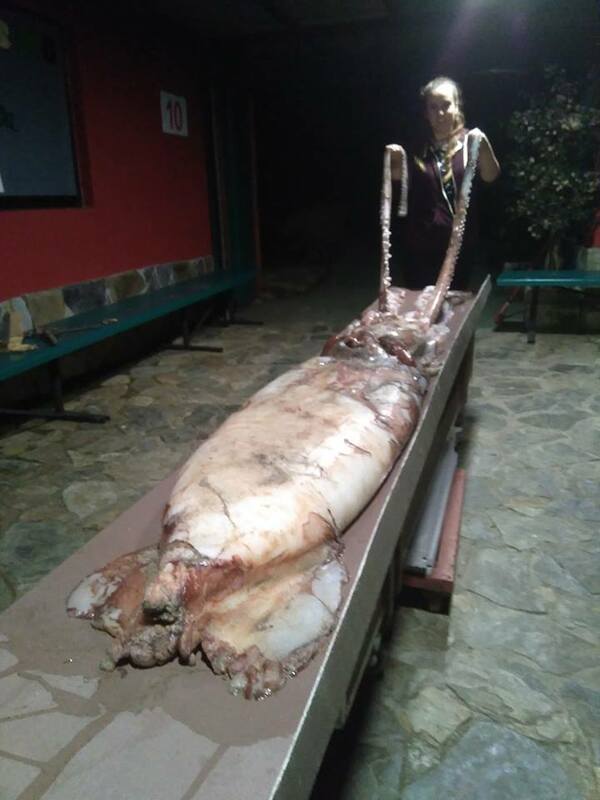 That would be the giant squid (Architeuthis dux) found washed up this week on the shores of Galicia in Spain. The supersized specimen was brought to biologists at Coordinators for the Study and Protection of Marine Species (CEPESMA), where initial testing revealed the cause of death: the deep-sea creature died from injuries sustained in a battle with another giant squid. 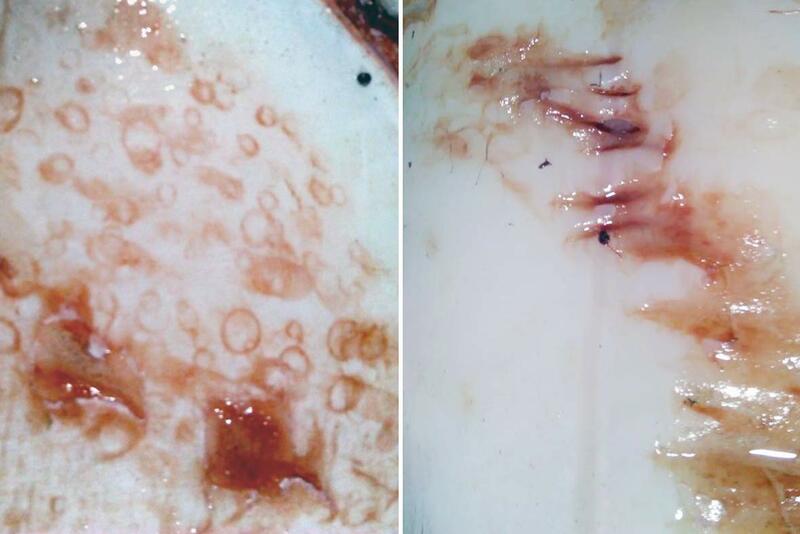 "We're sure the injuries came from another squid, because we had a specimen from a previous attack, so we could compare the two," CEPESMA president Luis Laria tells us. 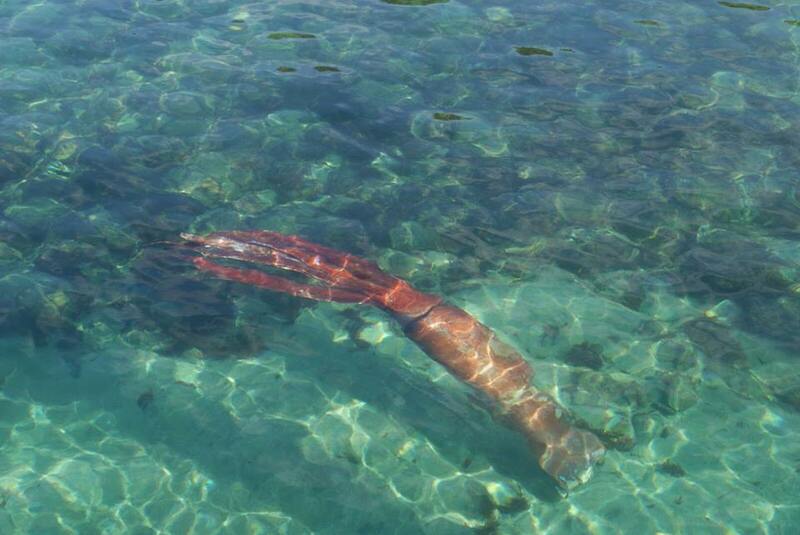 Shortly after the story of the washed-up giant broke locally, the CEPESMA team received some news of their own: a holidaymaker had photographed the squid – alive – just days before. Javier Ondicol, a Leon resident, had seen the animal while strolling through a Galicia port. "What started out normal, watching your partner enjoying the sea, turned out not so normal. I saw something moving in the water and started to take pictures," he told the team [translated from Spanish]. "Then a great being looked at me, twisted its body and moved its watchful eye while changing colour like a neon sign." It's very likely that the squid was already extremely weakened, if not dying, when it approached the shore in a disoriented state. 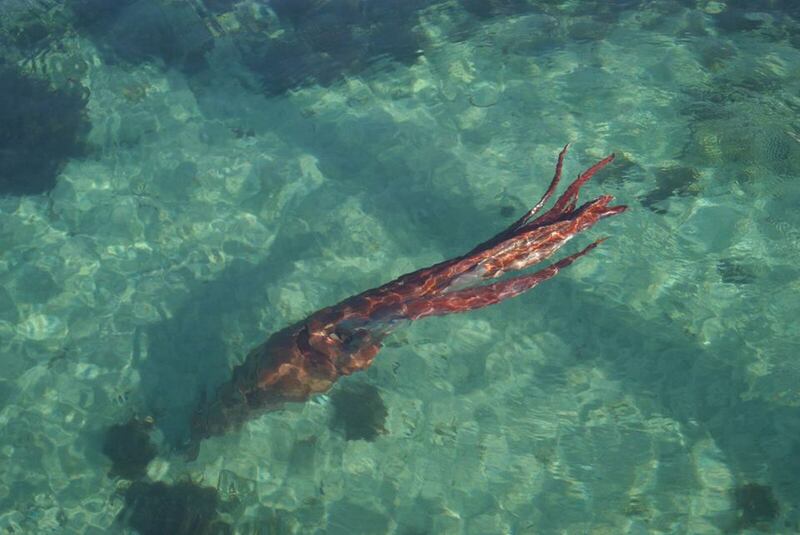 Giant squid do frequent these Spanish waters (in fact, this is the fourth specimen to be handed over to CEPESMA this year), but the elusive animals prefer to keep to the depths. "The live photos are very important because they show us their behaviour in a way we would not otherwise see," explains Laria, who will also oversee the preservation of the specimen at Parque de la Vida. This is only the second time that evidence of such a "battle of the Titans" has reached the researchers. 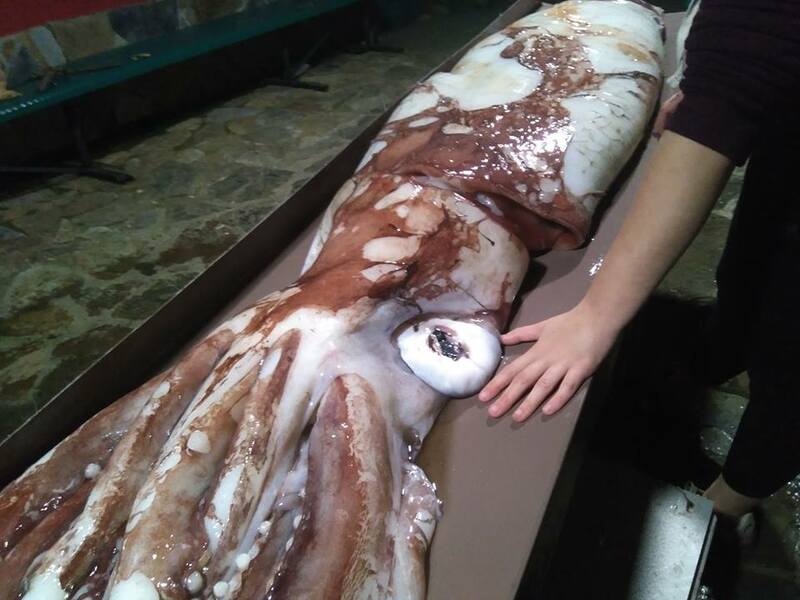 The previous case was discovered early last year, when the sucker-marked body of a squid was hauled up by fishermen in the town of Villaviciosa. 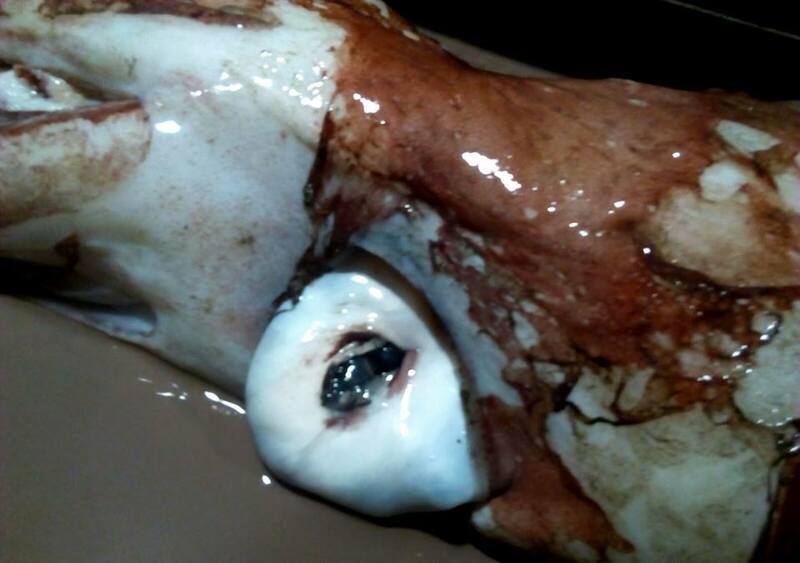 Because the Galicia squid's injuries are also consistent with those caused by giant squid suckers (which are lined by a serrated ring), the team suspects this latest attack unfolded in much deeper water. "The piercing damage affected the mantle and reached a gill, as well as damaged one of the eyes and other parts of the body," adds Laria. The squid's other eye was intact, which supports the idea that the animal rose to the surface very slowly, and only after it was injured and disoriented. Had its ascent been rapid, Laria suggests, the eye's structure would not have been preserved. Establishing what giant squid like to eat can be tricky. Specimens with full stomachs rarely turn up for scientists to study, and these animals also tend to chop up their meals very finely. Once sliced into bite-sized pieces by the squid's beak, prey is macerated by the radula, a tongue-like organ covered with rows of teeth. Still, scientists believe that, at least occasionally, the animals will sample their own kind – and the latest sighting has Laria wondering just how often that happens. "This makes us wonder if they are regular cannibals or if this [attack] was the result of a battle over territory or other causes," he says. "These animals can display very high aggressiveness amongst themselves." A 2005 study from University of Tasmania biologist Bruce Deagle found squid beak fragments in the stomach of a giant squid caught by trawl fishermen, and while broken beaks are hard to identify, DNA within the animal's stomach slurry indicated giant squid parts had indeed been digested. Because our knowledge of giant squid comes mostly from dead specimens, it tends to be limited to their anatomy. We know these animals have three hearts, blue blood and a donut-shaped brain – but when it comes to answering questions about their behaviour and ecology, scientists are still in the dark. The Spanish find offers a rare opportunity to learn more, and there is much that interests Laria beyond the potentially "cannibalistic" cause of death. The animal's giant preserved eye, for instance, can be studied in detail. How giant is giant? Hold your hand out and spread your fingers as wide as you can. That's about the size of the eye that would meet yours in the murky depths. What is this crazy creature you keep seeing in your feed?